Sedona's Tree House is a unique Art and Gift shop in uptown Sedona. Our earthy theme offers a different shopping experience and our local art is truly one of a kind including a variety of red rock bonsais, wire wrapped trees, hand sculpted bronze bonsais, hand turned waterproof vases inlaid with turquoise, Sedona photos and many more special items. Most of the unique items we carry are original pieces crafted by local artists. This shop is unlike any of the others in uptown Sedona, and you will feel like you have walked into another world when you step inside. At the center of the store is a 700-year-old Alligator Juniper tree wrapped in lights! 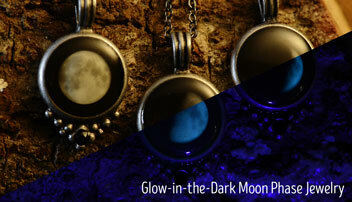 Find out what moon you were born under and match it to our moon phase necklaces that glow in the dark! Sedona's Tree House is located along the highway in Uptown Sedona in the Matterhorn Shoppes plaza. Copyright © 2018 RED ROCK TV. All Rights Reserved.